Home sweet home! Although we had a good trip (most of it was good -- some of it wasn't so great), it is always great to be home. Just in time for Hurricane Irene! I have a ton to do today, but wanted to pop into blogland to share a bit with you before I jump into my emails with both feet. This card uses the Back-to-Back Technique (from the August 2011 Technique Junkie Newsletter) for the background, with the main panel highlighted with a Torn Frame (December 2008 TJNL). All of the stamps are from Stampin' Up!. 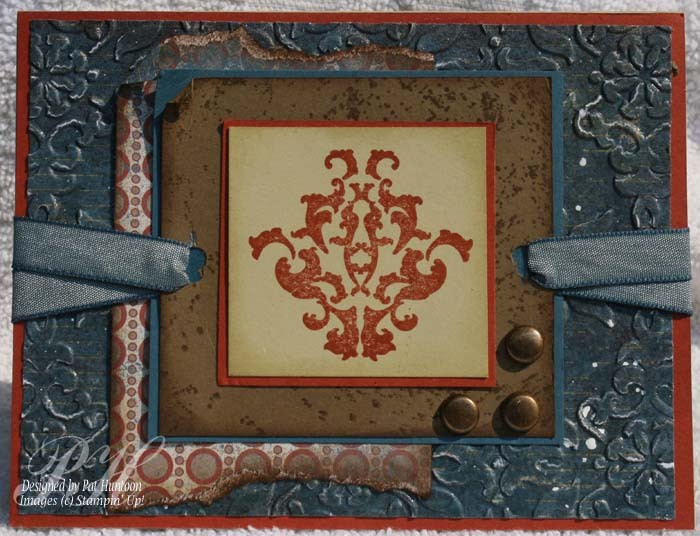 This was a perfect card for LNS Challenge 135, too, since I adore the stamps, the buttons, the clips, the lattice Embossing folder...you get the idea!! I love this set of stamps. Birds always remind me of my mother -- she was a bird-watcher, and got excited every time she would see something vaguely exotic. 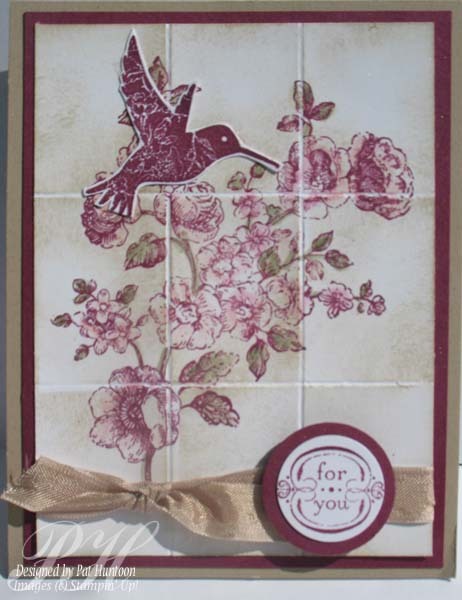 It makes me smile just to make bird cards. I think I have a bit of her in me -- I spent a considerable amount of time this week with binoculars glued to my face, looking out of over the spectacular salt marsh on the Delegal River in Savannah from my Mother-in-Law's floor to ceiling windows. And yes, I saw ALOT of birds and got just as excited as my mom used to! Hope you all stay safe from Nature's fury this weekend! As you read this, I am off to take my oldest son to college. It is a bittersweet time for me. I am thrilled that my son is starting a new chapter into adulthood, but melancholy about the big hole that he leaves in my heart because of his impending absence. Millions of moms get over this every summer. I will too. This card is dedicated to him. I used the Glassy Embossing Technique (on the Emboss or Die CD) on the Well Worn Designer Paper and added other distressing touches to finish off the card. In addition to the college orientation and drop-off, we are visiting my dad and dh's parents while we are south-bound. I will have internet access on and off for the week and may check in from time to time. Any orders placed between now and August 25th will be processed upon my return. Today I have TWO cards to share. I am in love with a color combination and I need to get these out of my system so I can move on! The colors are Rich Razzleberry and Crumb Cake -- I think they are fabulous together! 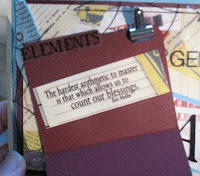 The card above uses the combo on a Faux Tile Card from the June/July issue of the Technique Junkie Newsletter. I used the Elements of Style Stamp set with my other new love - Seam Binding Ribbon (have you tried it? SOOOO great -- thank you, Nancy Hill, for showing me it! I am obsessed!). This card was actually the first card I made with SU's Field Flowers set. I love the color combination of purples and greens, and I think it works here. I used the Cuttlebug Highlights Technique (October 2008 Technique Junkie Newsletter) on the Butterflies. The top butterfly is a little shadowed, but he is blissfully highlighted also! Hope you have having a great weekend! I love a brilliant idea. 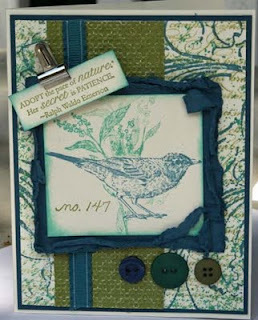 When Holly Brown brought me the Distressed Fuzz Technique (August 2011 issue of the Technique Junkie Newsletter) used on the card above, I was very excited! After all, Flower Soft can be pricey -- and who doesn't love custom colors made from an item that EVERY stamper has in their Stash? GREAT idea, Holly. 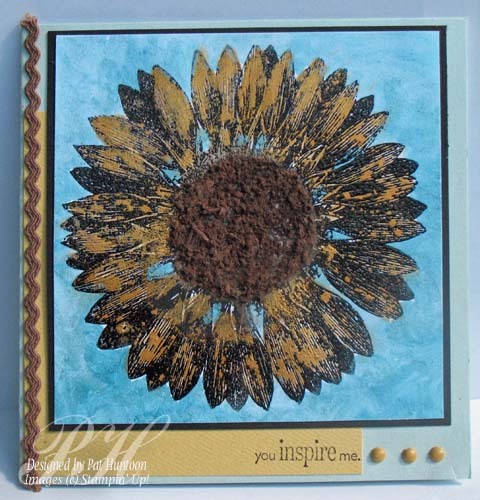 My Sunflower was colored with Smooch inks to give it an ethereal glow. 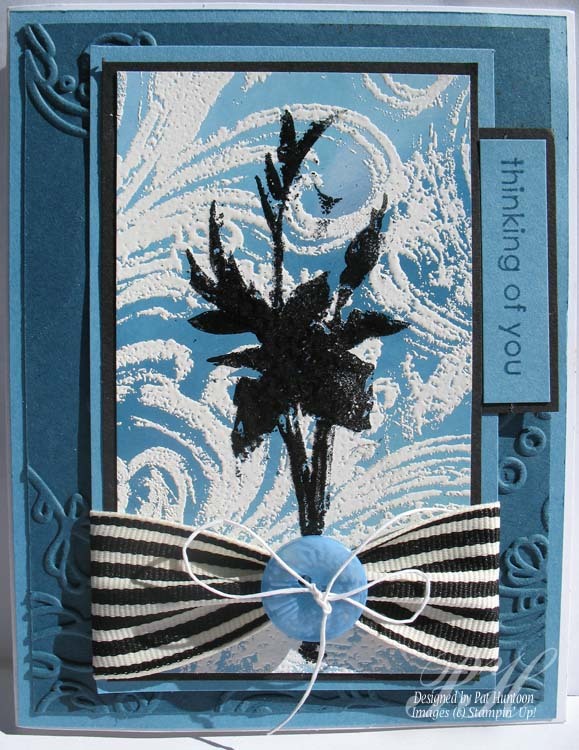 I also used some gorgeous shimmery paper from Paper Temptress for the card base and for the yellow cardstock portions. I wish you could see how shimmery this is IRL! 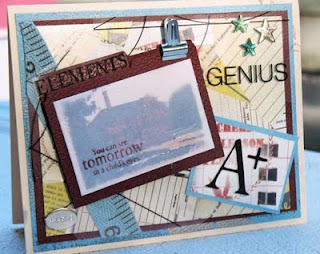 This Week's Blogger's Challenge was to create a Back-to-School type of card. I really struggled with this -- in my stash of thousands of stamps, I have only a few school-related items.This forced me to think outside the box -- but I am pleased with the results. The card here uses Club Scrap stamps on the front of the file folder using the Vellum Sentiments Technique from the August 2011 issue of the Technique Junkie Newsletter. I really wanted a collaged look for the background,so I used a combination of stickers, ribbons, transparencies and stamps to get the look I wanted. 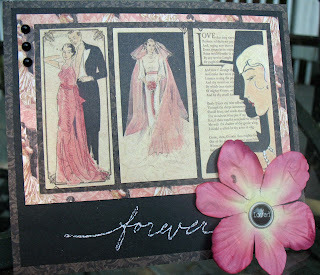 I really had to dig deep into my scrapbooking stash with this challenge to find just the right accents! Feel free to play along in the challenge this week by adding your entry to the links below. And make sure that you take a peek through the other challenge entries -- they are always great! 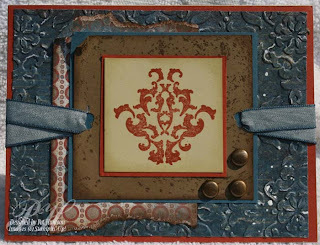 One thing I did a little different for this card was to "double stamp" the French Filigree background (the white part). I love the stamp but I wanted a bolder look, so I inked the stamp, put it face-up on my work surface, smooshed the paper on top, then lifted the paper a little and moved it over ever-so-slightly before smooshing again to create a bolder look. It came out exactly as I wanted it! After I made this, I realized that I did EXACTLY the same ribbon treatment on this as I did the Framed Nesties Card from yesterday...oops! 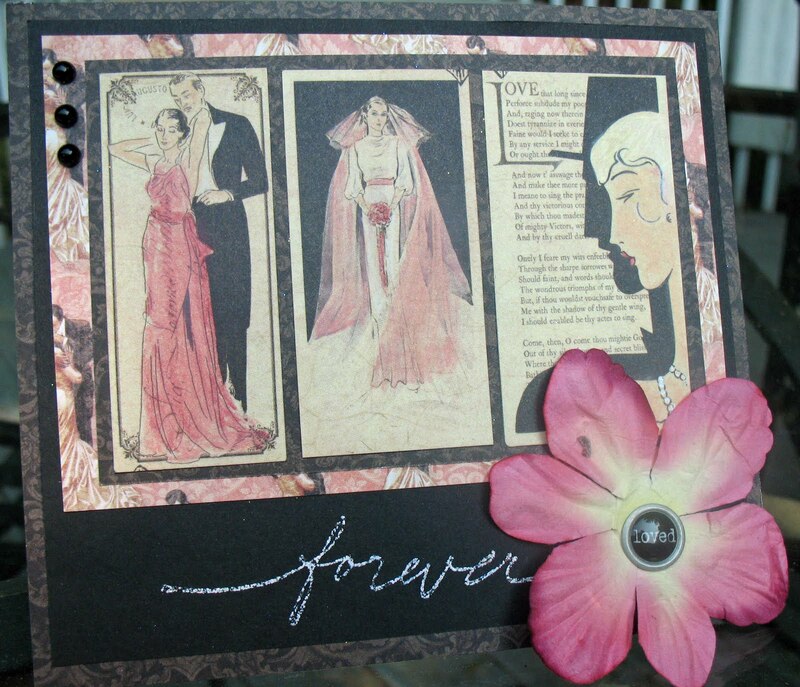 I had actually created the pink card weeks ago...so it wasn't top of mind (or maybe it was!). Oh well, I still love the way this turned out! All stamps Stampin' Up! : Fabulous Florets, Trendy Trees (Sentiment), French Filigree. 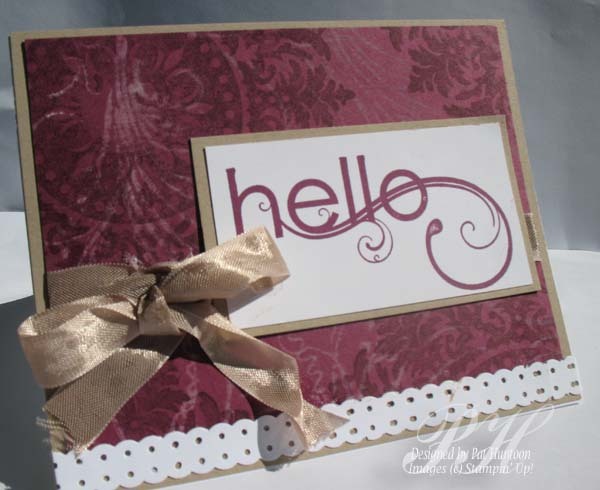 Elegant Lines Embossing Folder. Marina Mist, Bashful Blue, Black, White Inks and paper. 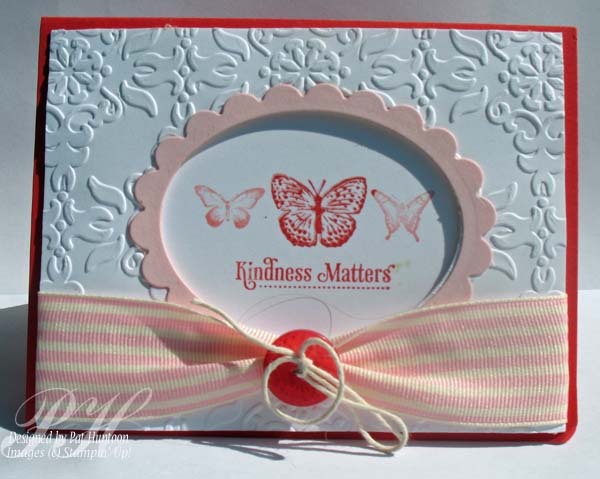 Kindness Matters Nestie Window - Special offer! I really don't work with PINK enough! 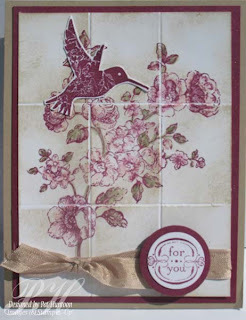 This card uses the Stampin' Up! Kindness Matters stamp set with the Framed Nesties Window Technique from the August 2011 issue of the Technique Junkie Newsletter. What I love about this technique is the ability to use oval/circle/square Nesties, punches, cutters, etc to achieve the same effect. If you are not a Newsletter subscriber yet, check this out! You can subscribe to the Newsletter from now through the end of 2012 for only $22.00 (Canadian: $26.00, Overseas: $30.00) -- that is a $5.00 savings from the regular price!! Your subscription will start immediately with this issue so you can view this technique, plus the other 14 techniques in this issue with one password. Want to see more? You can pre-order CD9 (covers the issues from 10-10 through 8-11) too, for just $14.95 ($16.95 overseas) more -- giving you access to 100 MORE techniques. Click HERE to get started - both options are available through that link. Already a subscriber? Renewal Specials and CD orders can be found HERE. I'm back from vacation, got through thousands of emails yesterday, and I am ready to stamp! Just a few more details to take care of this morning, and then I can get creative. I can't wait! 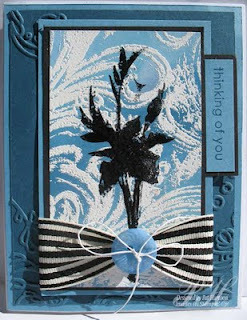 This card was made before I went on vacation - in fact, I made it almost a month ago with my friend Nancy Hill. I was just playing around with the technique and ended up showing a few fine ladies how to do it. It uses the Faux Tiles Technique from the June/July 2011 issue of the Technique Junkie Newsletter. 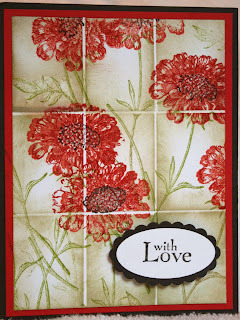 The stamps are from the Field Flowers set from Stampin' Up!. 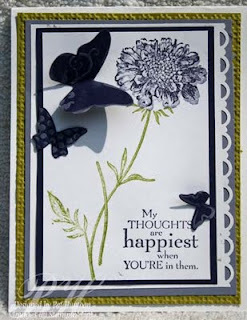 Making this card took patience -- not because of the technique, because that is easy -- but because of the use of the stamp positioner on all of the flowers! 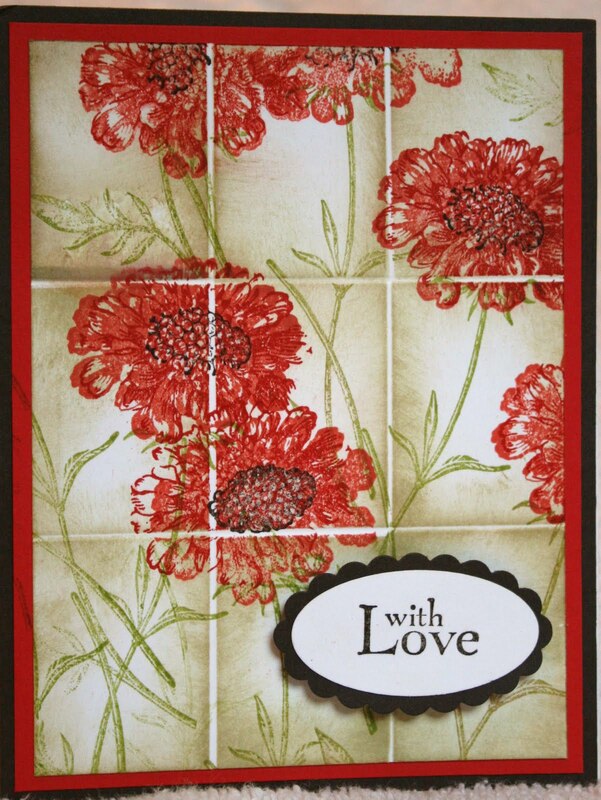 I love this Graphic 45 paper...but it is a little dull. I spiced it up a bit using the Pastel Chalk Pencil Blending Technique from the June 2011 issue of the Technique Junkie Newsletter. What do you think? Do you like the "enhanced" papers?